Every truck in Oahu has a spin on street fries. 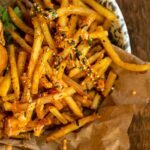 This beef tallow furikake fries recipe is my take on the best street food you can get and bring back to the Mainland. Carefully remove the fries from the oven and flip on the pan using a spatula.